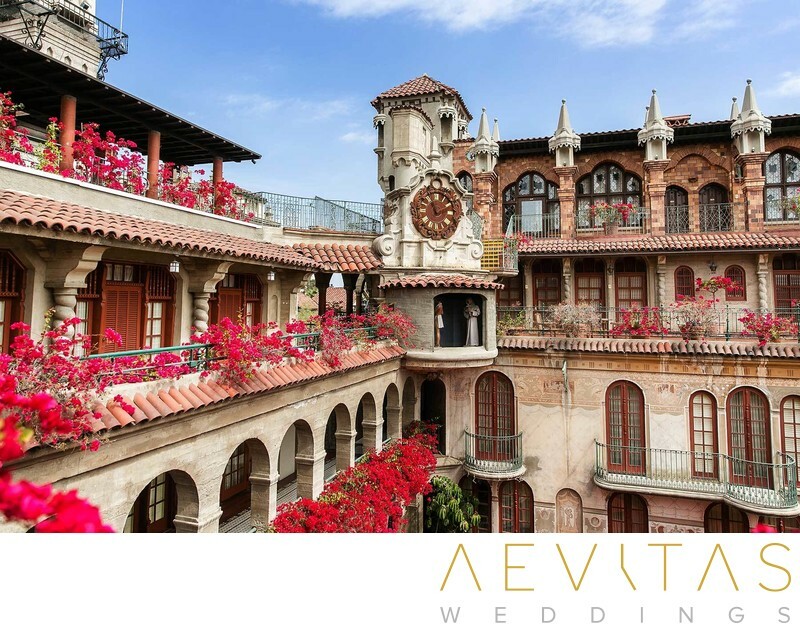 Graced by ten different US Presidents, the Mission Inn Hotel And Spa will no doubt exceed all expectations for your wedding day. This lavish and sprawling heritage-listed complex exudes elegance and historical class, with ornate Spanish Mission-style architecture and countless rooms, courtyards, chapels and reception spaces. The Mission Inn dates back to the late 19th century when it first opened as a two-story guest house in 1876. Over the years it was gradually expanded, with the Cloister, the Spanish and the Rotunda wings added at the start of the 20th century by its owner Frank Miller. Although the name suggests it once housed missionaries, it actually refers to the project being the lifelong “mission” of Miller. Today it boasts 238 rooms and suites, built in an eclectic range of styles that include Moorish, Italian Renaissance, Spanish Baroque, Chinese, and Japanese. Everywhere you look there are intriguing architectural features - gargoyles, turrets, spiral staircases and stained-glass windows, making it a wedding photography dream location. From couple portraits to bridal party portraits and family formals, there are always stunning backdrops filled with art and artifacts collected by Miller throughout his world travels. They provide spacious rooms for both the bride and groom to get ready in, situated a suitable distance from each other, and their naturally-lit courtyards provide the ideal location for first-look wedding photo sessions. For couples wanting a religious ceremony there is the richly decorated St. Francis of Assisi Chapel, with its Mexican Mahogany wooden doors, which can seat up to 150 guests. Or for a more intimate venue, opt for the tiny St. Cecilia Chapel with its 18th century marriage altar which seats just 12. Alternatively, you can exchange vows in their beautiful outdoor courtyard, then head indoors to one of their many banquet halls and private clubs. Whether you are hosting an intimate wedding celebration or a reception of up to 300 guests, the Mission Inn Hotel And Spa’s reception spaces exude warmth and grandeur. You can choose from the lavish Grand Parisian Ballroom, the richly appointed Spanish Art Gallery, the black and white tiled Santa Barbara Room, the Asian-inspired Court of the Orient And Ho-O-Kan Room, and the regal San Diego Room. All catering and beverages are provided on-site (no BYO) and they have a team of highly experienced event coordinators to help your day run as smoothly as possible. The Mission Inn Hotel And Spa is listed as a National Historic Landmark and never ceases to impress guests who step inside this Riverside oasis. Despite its long and evocative history, the Mission Inn Hotel And Spa has recently undergone extensive renovations to ensure its facilities are contemporary, making it ideal for couples that want charm and historical elegance, without compromising on modern comforts.